When Ronald Reagan spoke on Memorial Day, you know the words flowed from his heart. MAY 25TH, 1981: Today, the United States stands as a beacon of liberty and democratic strength before the community of nations. We are resolved to stand firm against those who would destroy the freedoms we cherish. We are determined to achieve an enduring peace — a peace with liberty and with honor. This determination, this resolve, is the highest tribute we can pay to the many who have fallen in the service of our Nation. MAY 31ST, 1982: The United States and the freedom for which it stands, the freedom for which they died, must endure and prosper. Their lives remind us that freedom is not bought cheaply. It has a cost; it imposes a burden. And just as they whom we commemorate were willing to sacrifice, so too must we — in a less final, less heroic way — be willing to give of ourselves. MAY 31ST, 1982: Our goal is peace. We can gain that peace by strengthening our alliances, by speaking candidly about the dangers before us, by assuring potential adversaries of our seriousness, by actively pursuing every chance of honest and fruitful negotiation. MAY 31ST, 1982: I can’t claim to know the words of all the national anthems in the world, but I don’t know of any other that ends with a question and a challenge as ours does: Does that flag still wave o’er the land of the free and the home of the brave? That is what we must all ask. MAY 26TH, 1983: I don’t have to tell you how fragile this precious gift of freedom is. Every time we hear, watch, or read the news, we are reminded that liberty is a rare commodity in this world. MAY 26TH, 1983: We owe this freedom of choice and action to those men and women in uniform who have served this nation and its interests in time of need. In particular, we are forever indebted to those who have given their lives that we might be free. Mr. Reagan says we need to speak candidly about the dangers before us. Are we doing that today? I’m concerned. First Amendment rights were substantially eroded under the Obama administration. Emboldened by political correctness and Leftist social doctrine, conservative voices have been largely suppressed and eradicated from our college campuses by the Left. Without free speech and religious liberties, we’re no longer America. Let us hope President Trump helps restore these basic freedoms. This Memorial Day, we honor the dead who sacrificed their lives for you and me. We can truly honor them by redoubling our efforts to restore the rights that have been siphoned away in recent years. Here are the states where taxpayers fund human abortion. Note that most of these states are Left-leaning. 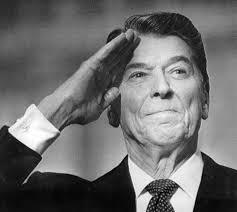 As a veteran, Reagan’s speech is especially moving. I still dont quite get why Obama is known as such a great orator. There has been NO ONE like Reagan for oration since. Obama (nor the others since) held a candle to Reagan. I know he was a professional actor, but he was gifted spiritually and intellectually. It wasn’t just great timing and ability to find one’s mark or the right camera.